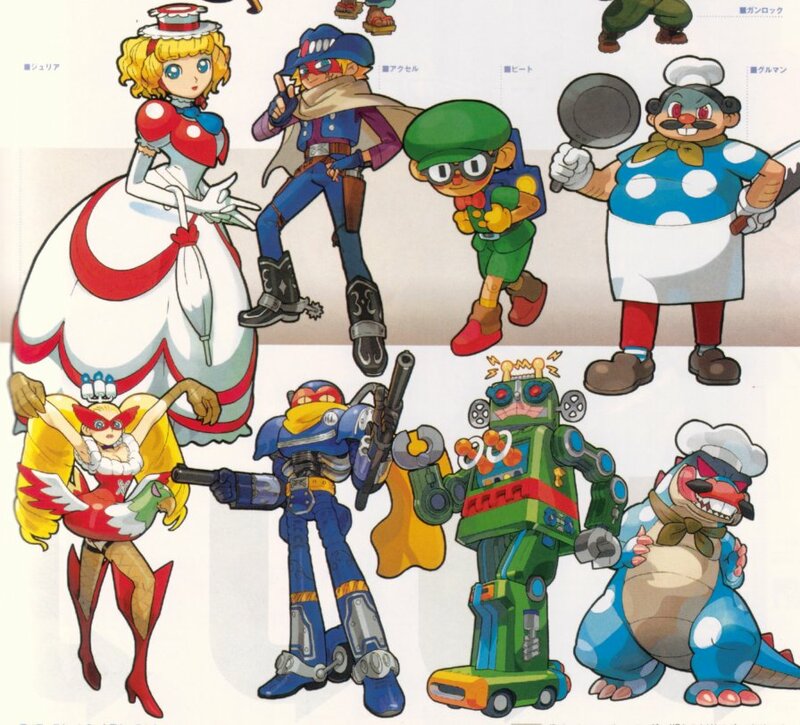 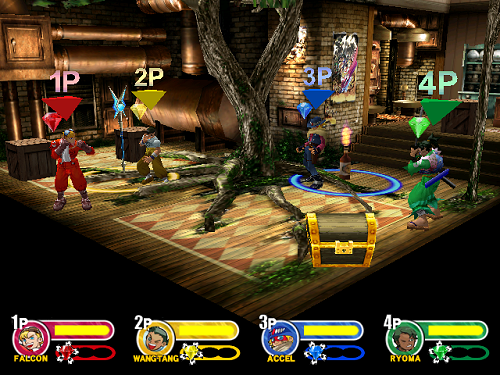 Six new characters join the series. 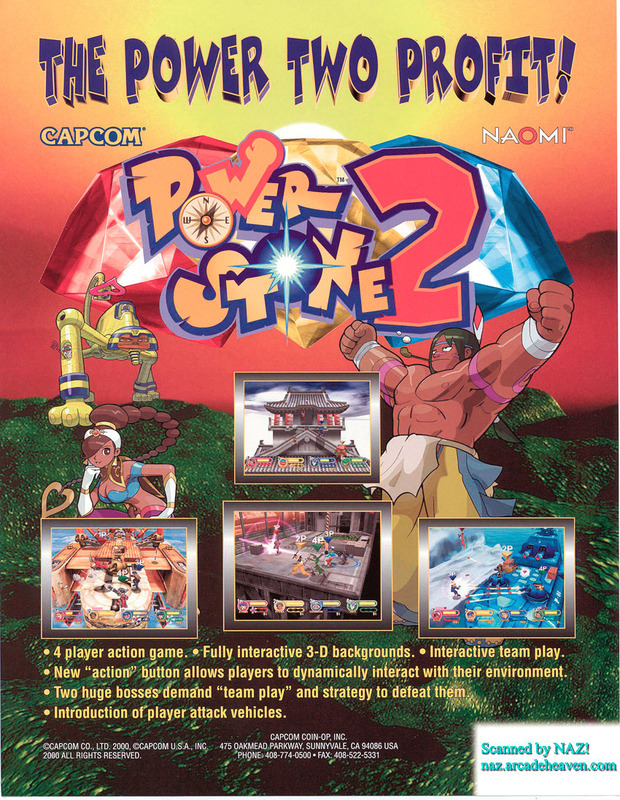 REVIEW: Power Stone 2 is the sequel to the original free-roaming "go-anywhere, grab-anything" fighting game by Capcom. 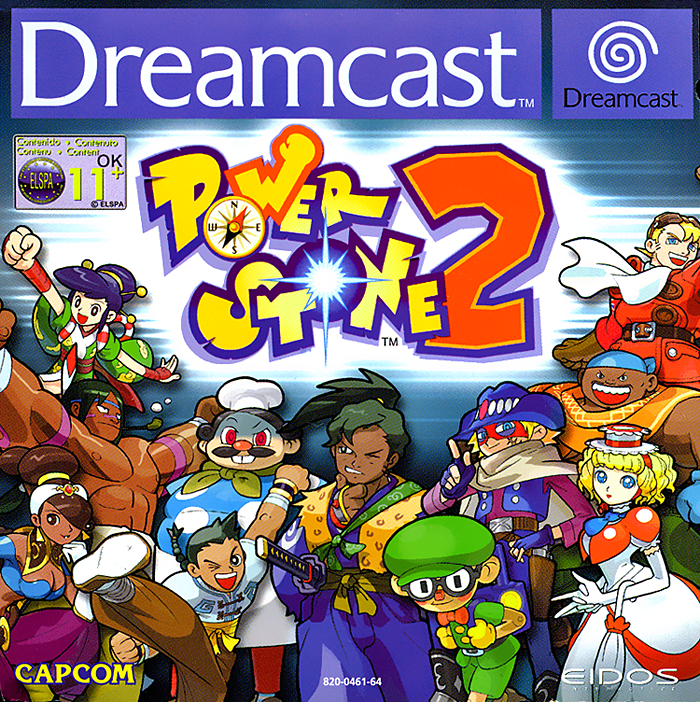 Power Stone 2 retains a lot from the original, yet presents 6 new playable characters along with bigger, crazier, and more interactive levels. 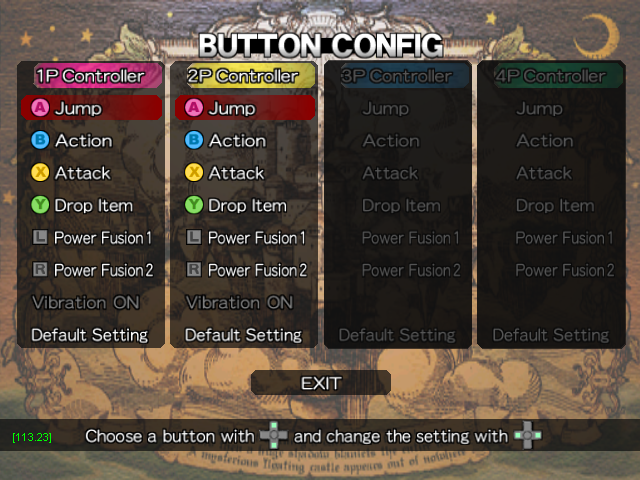 As a console fighting game, Power Stone 2 has plenty of modes and options. 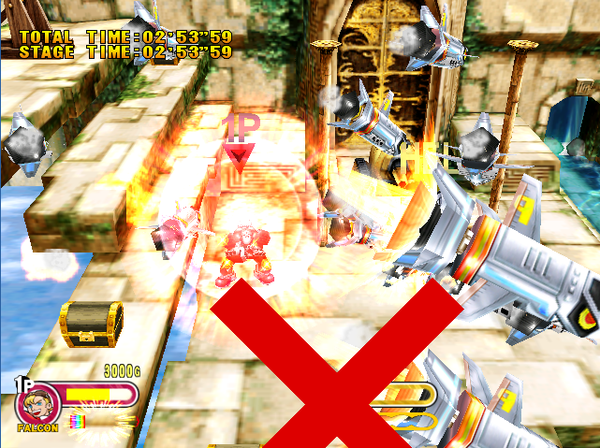 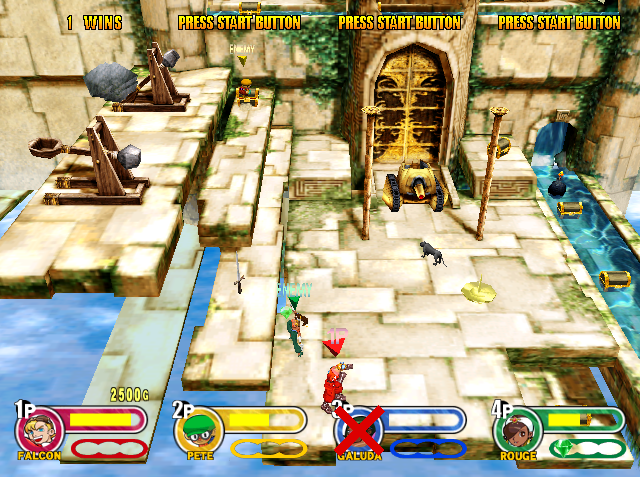 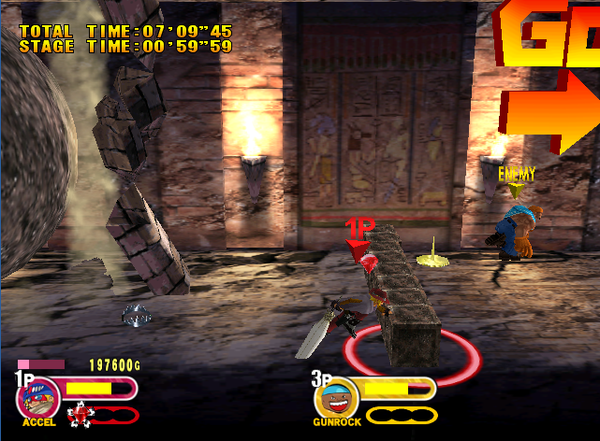 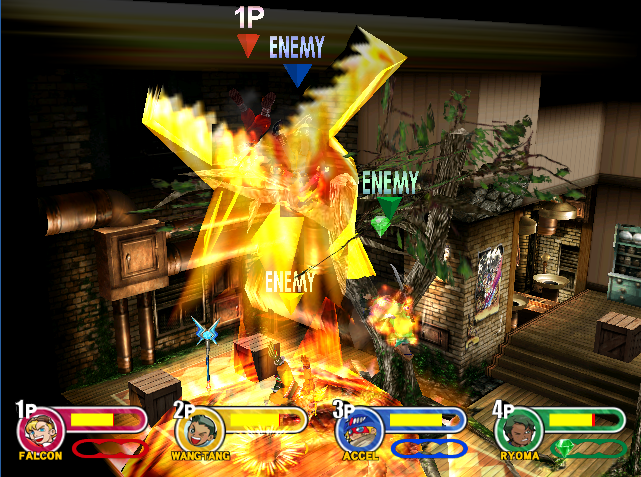 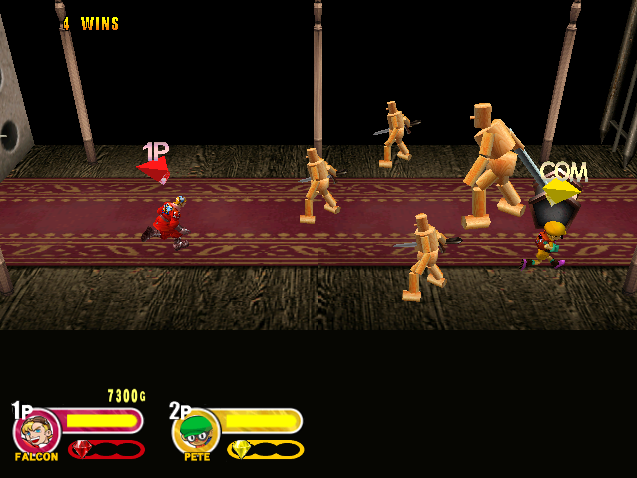 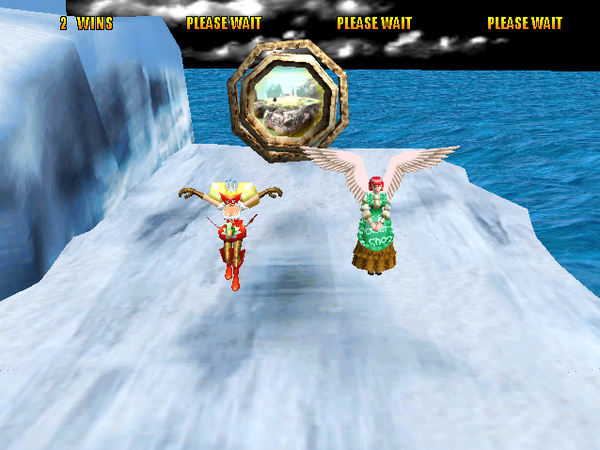 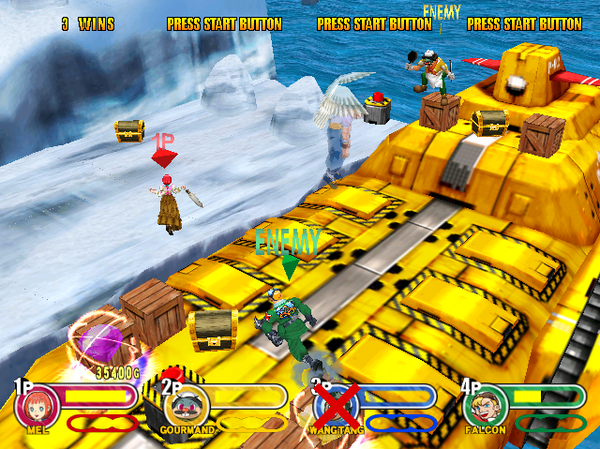 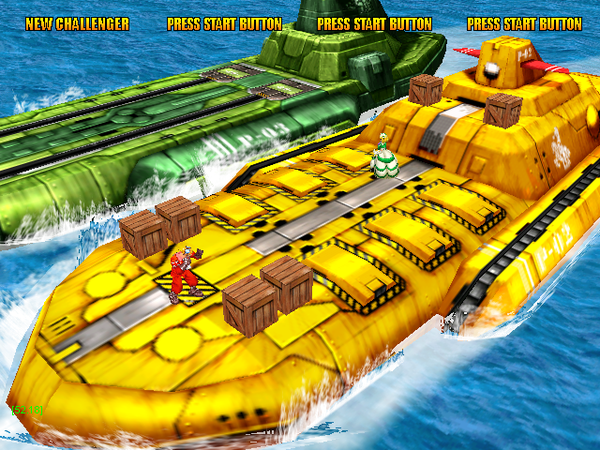 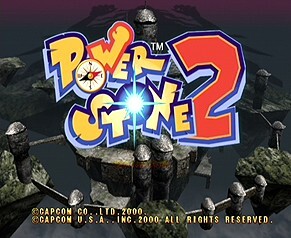 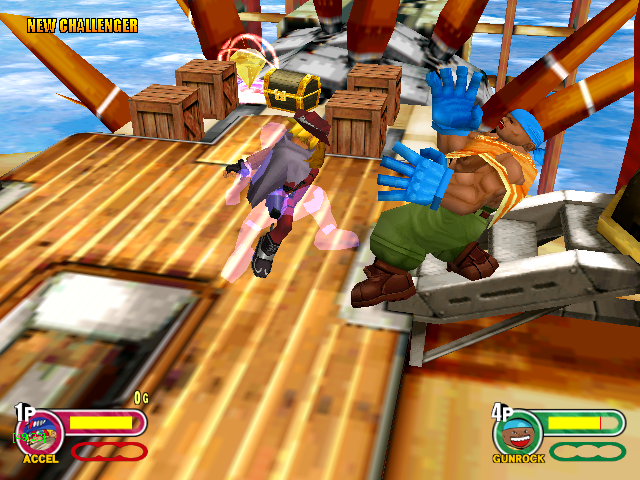 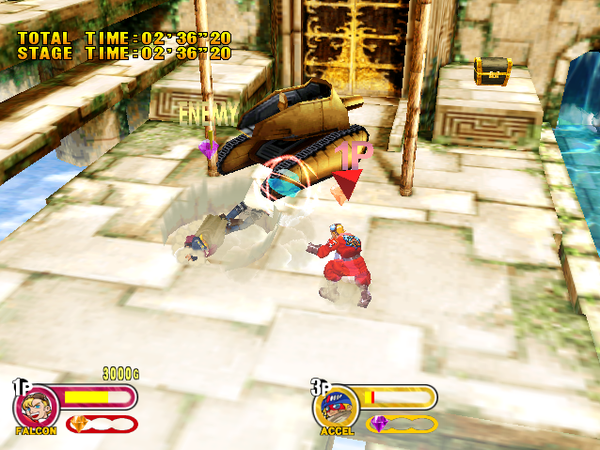 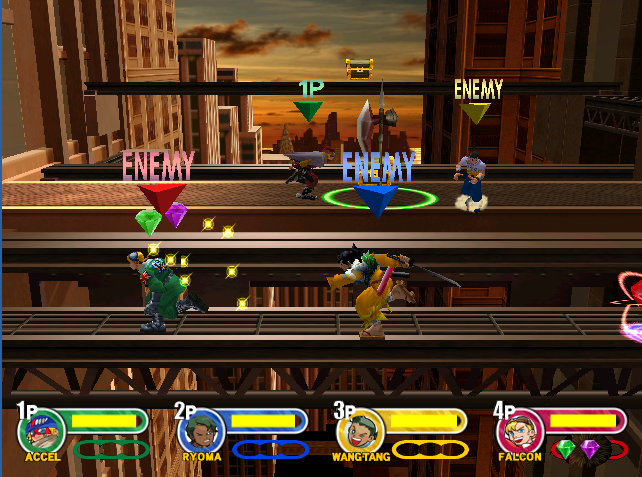 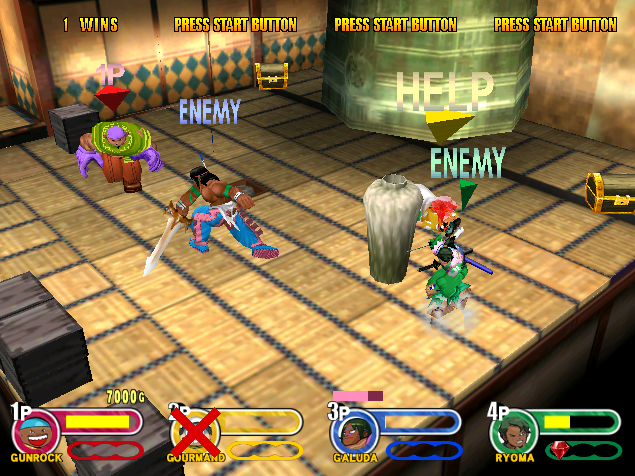 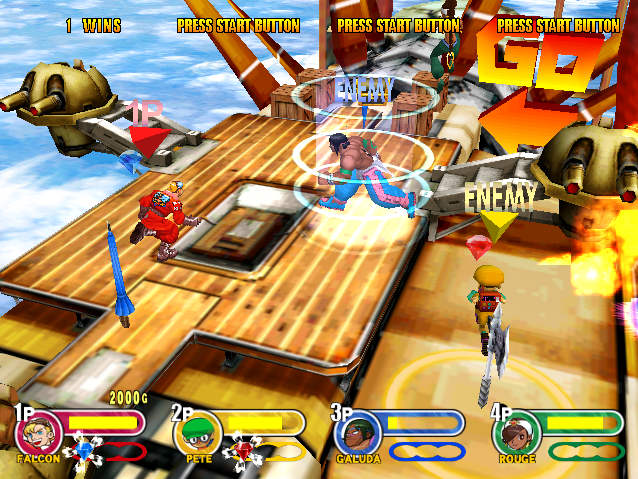 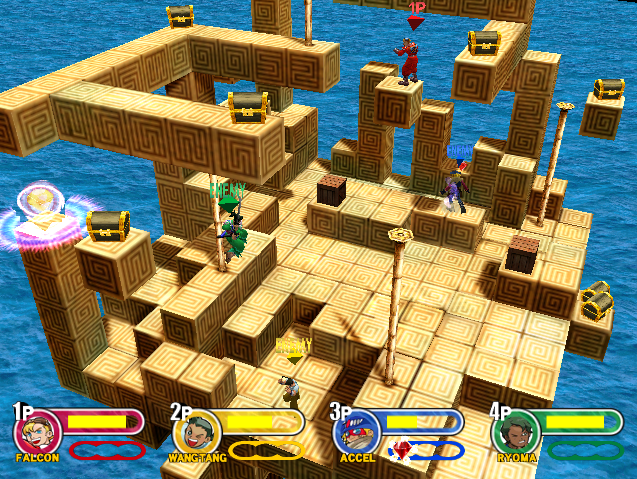 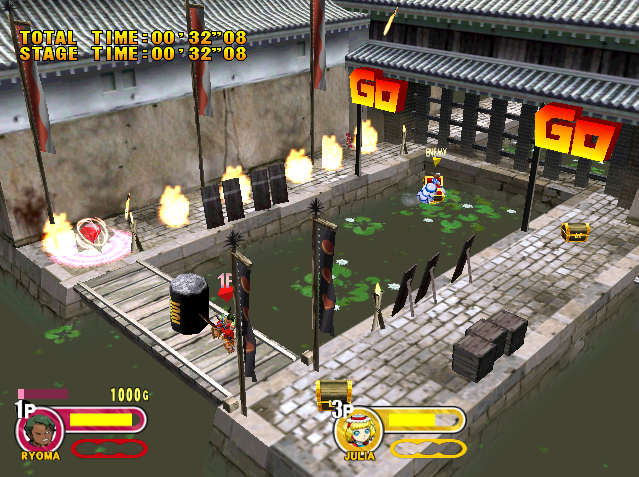 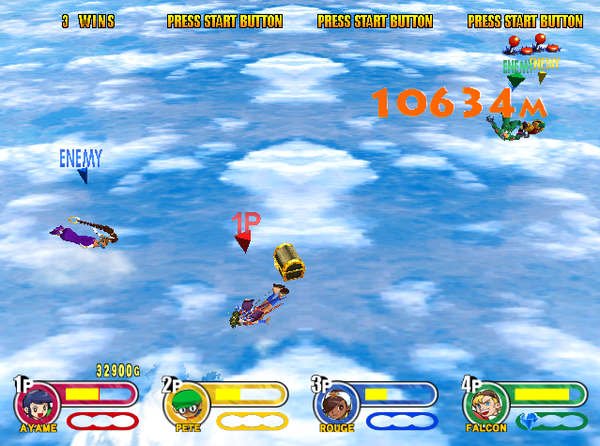 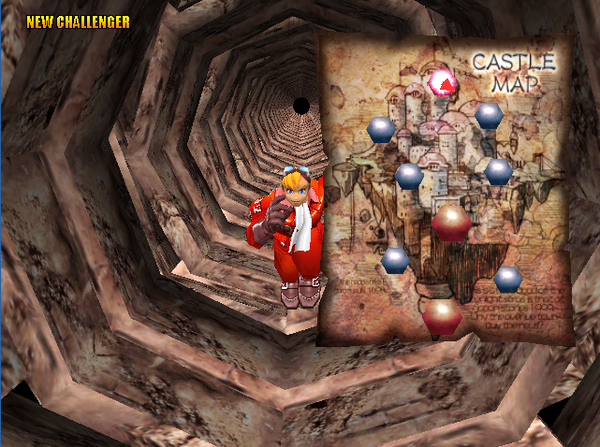 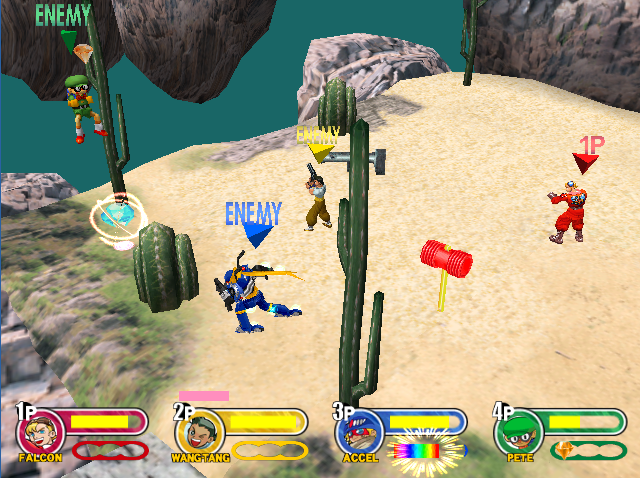 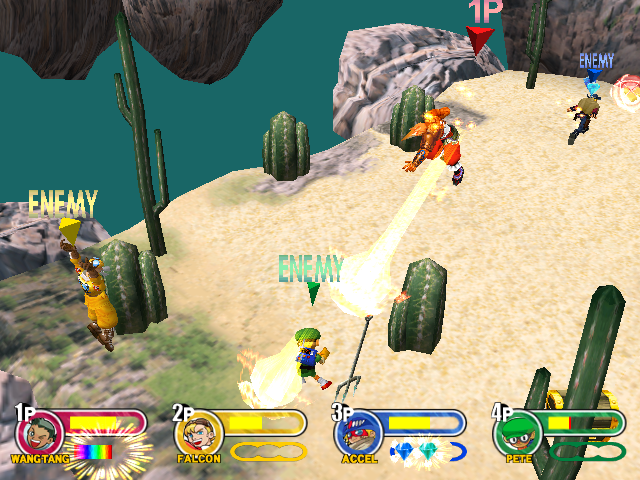 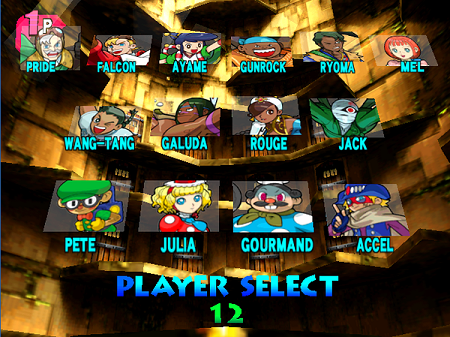 Power Stone 2 features several different gameplay options, including: 1-on-1 (A two-character storyline game), Arcade (A four-character storyline game, with two-characters advancing each round), Original (Multiplayer mode, with free choice of characters and stages), and Adventure (An unpredictable storyline game, where players can collect items, cards and money). 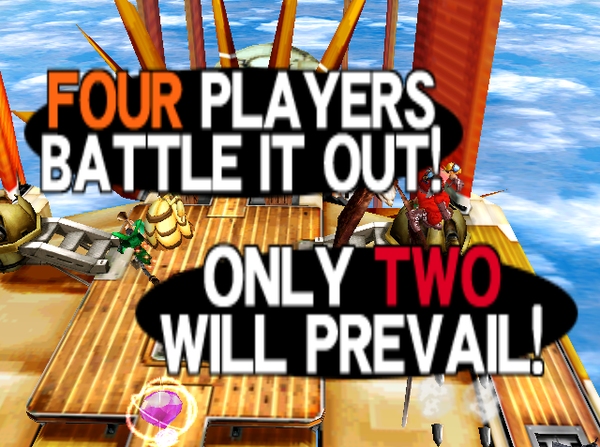 Things are about to get real ugly. 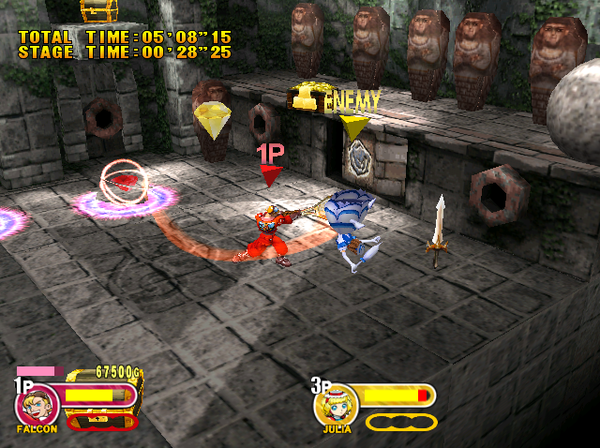 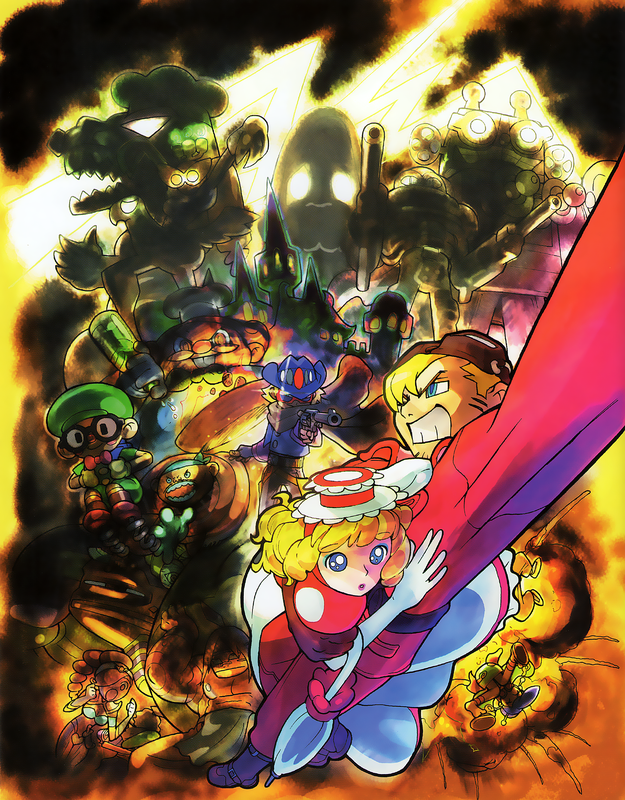 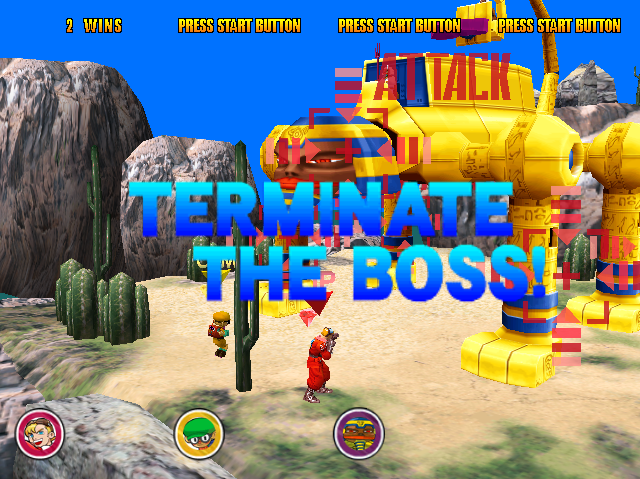 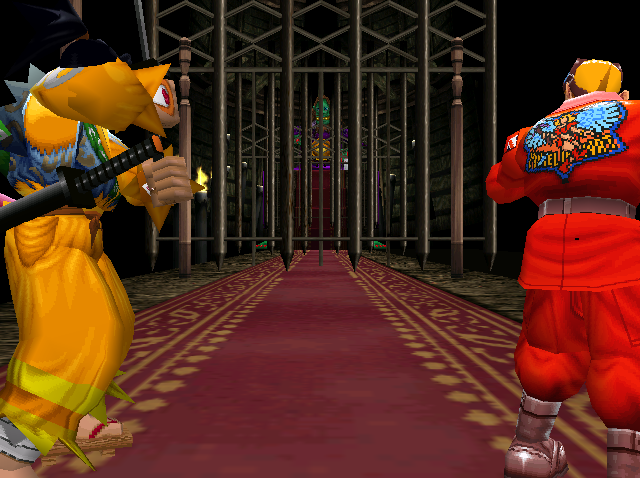 The game features 5 different stages from the start, with 3 unlockable boss stages. 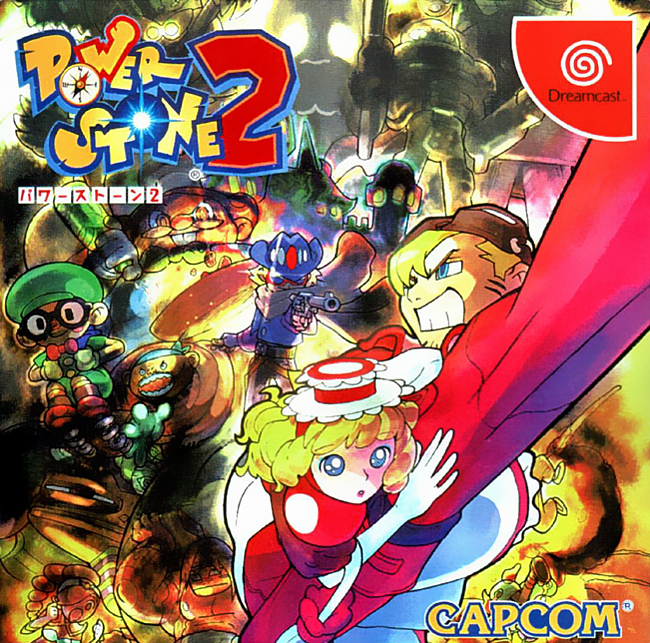 The environmental interaction has no doubt taken a big step forward in Power Stone 2. 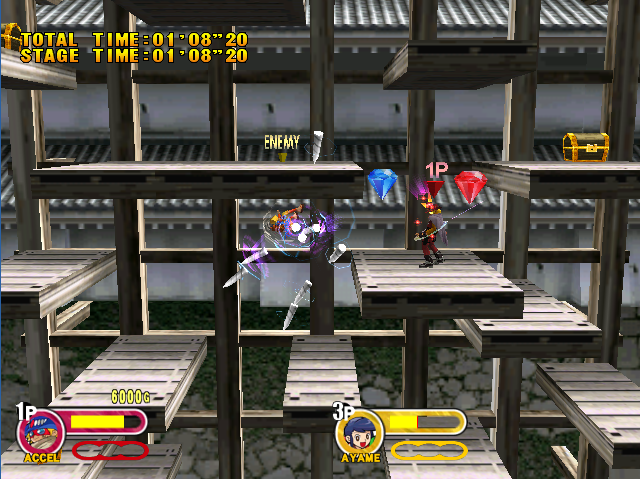 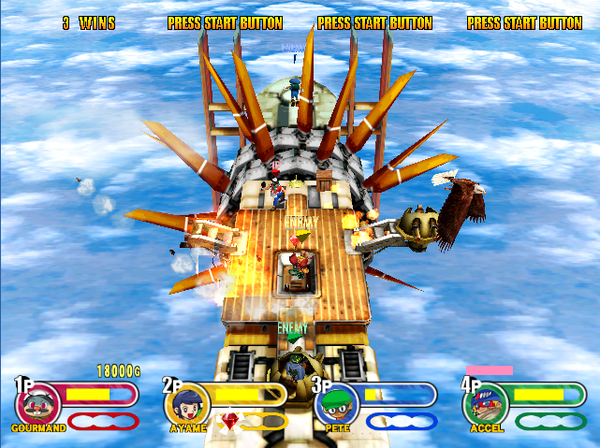 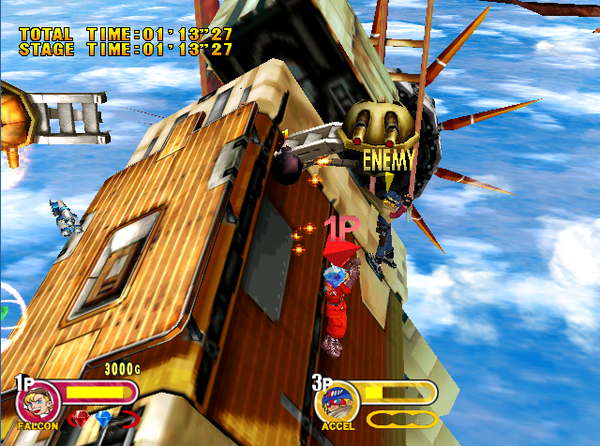 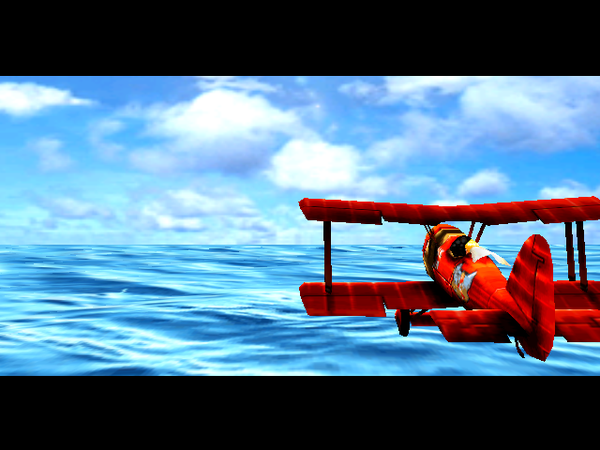 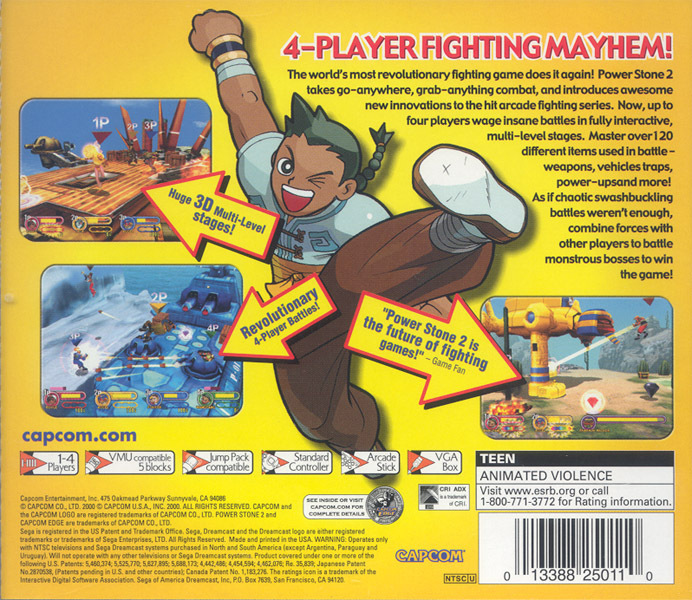 All of the dynamic environments now "evolve" as the fight progresses... for instance, the airship stage starts on board the ship, which will eventually fall apart and force all the fighters to continue fighting as they skydive down to a floating platform where the battle will commence. 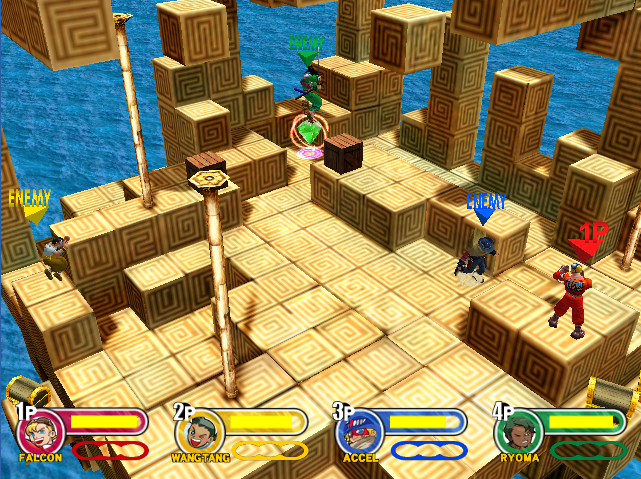 Item boxes are scattered across each stage in random places. Many of the items that can be used in gameplay first have to be unlocked in Adventure mode or created in the Item Shop. 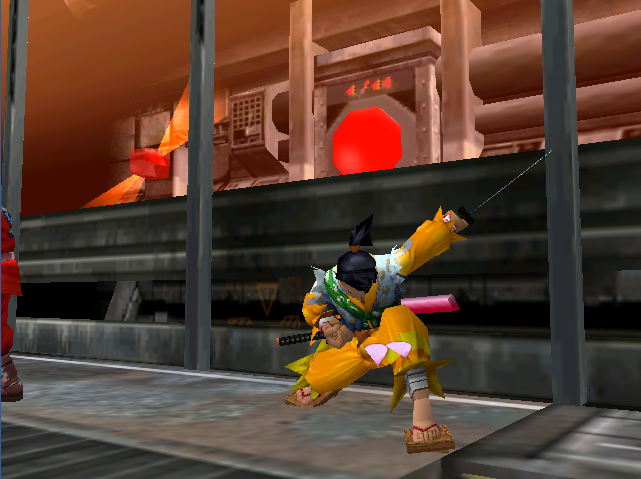 The items are incredibly diverse, some able to deal damage, and others with healing or defensive abilities. 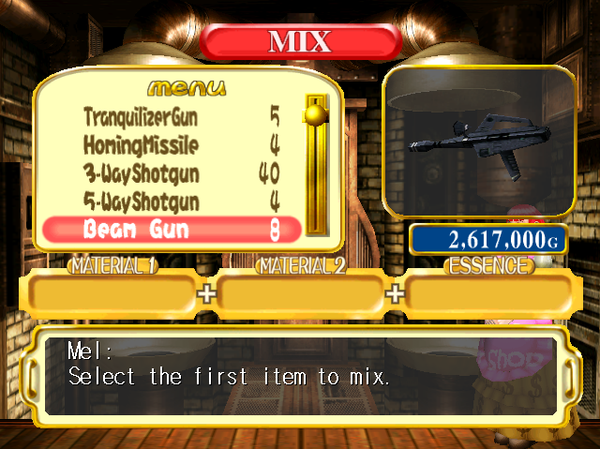 Some of the offensive items include: various guns, swords, hammers, bombs, etc. 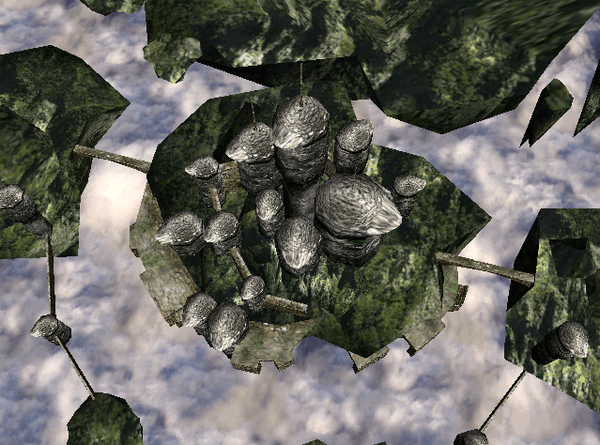 Defensive items include: food, shields, invisibility potions, and wings for super high jumps. 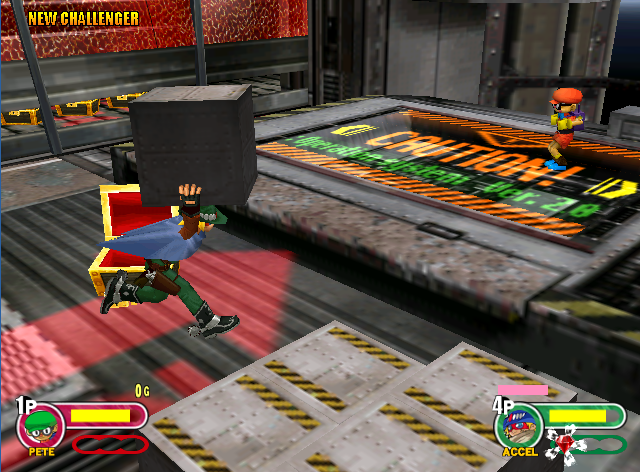 The item boxes may also contain Power Stones, and when a fighter obtains 3 of them, he or she will transform into a super-powered alter-ego and have a considerable advantage over their opponents for a short (but significant) period of time. 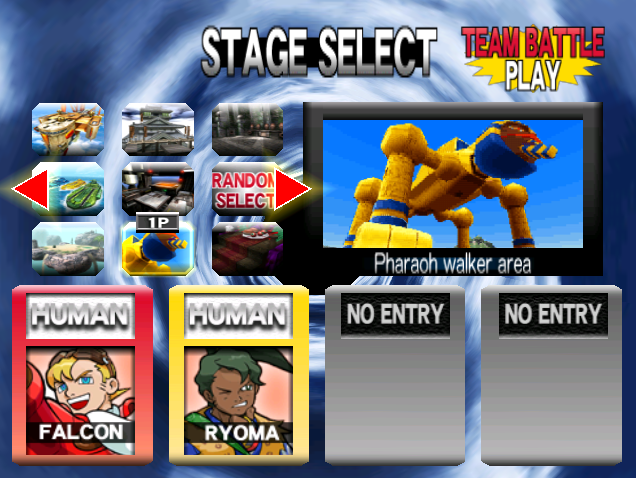 There are 2 huge bosses to fight in Power Stone 2, Pharaoh Walker, a huge sphinx-like robot, and Dr. 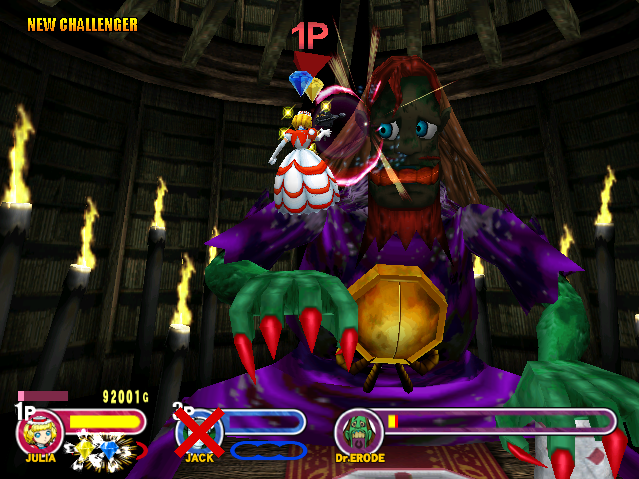 Erode, a giant green monster sitting at a table. 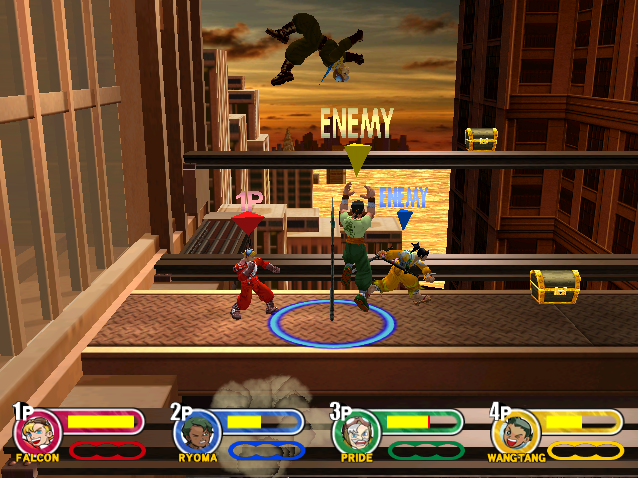 The boss fights are challenging, but in my opinion, aren't nearly as fun as the 4-player mayhem that the multi-player mode offers. 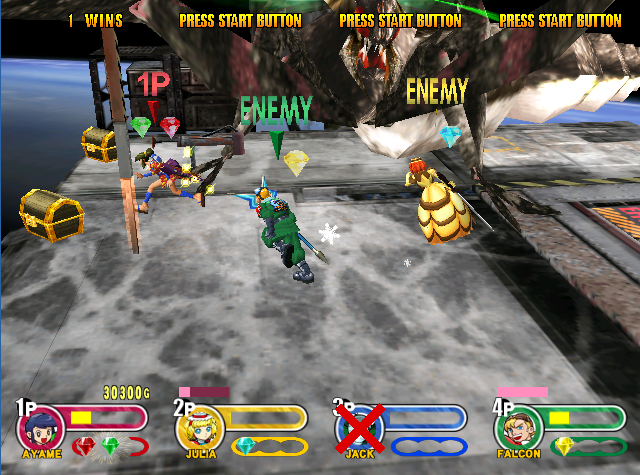 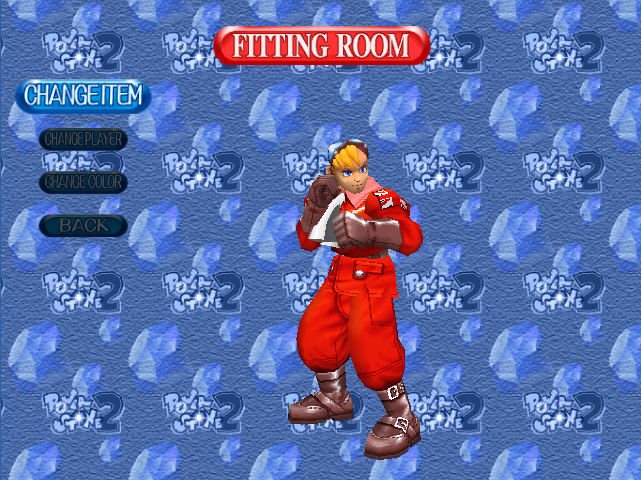 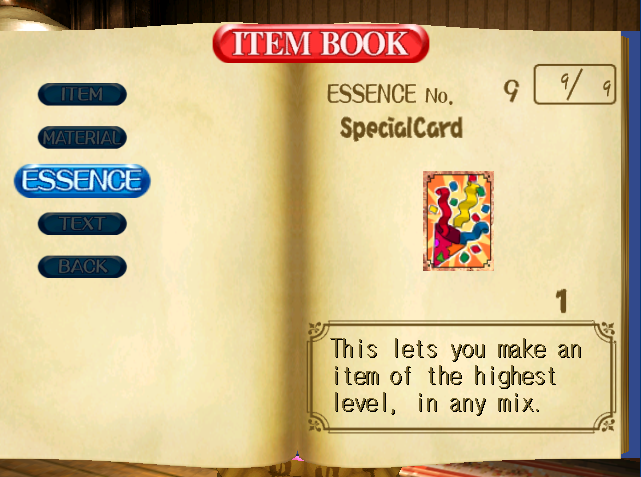 Like several other Dreamcast games, Power Stone 2 also includes a VMU application called the Mini-Book. 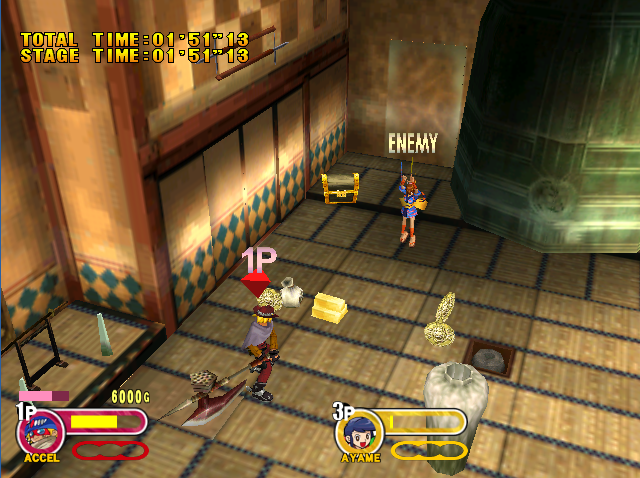 This can be used to inspect the player's item inventory, or trade items with another player. 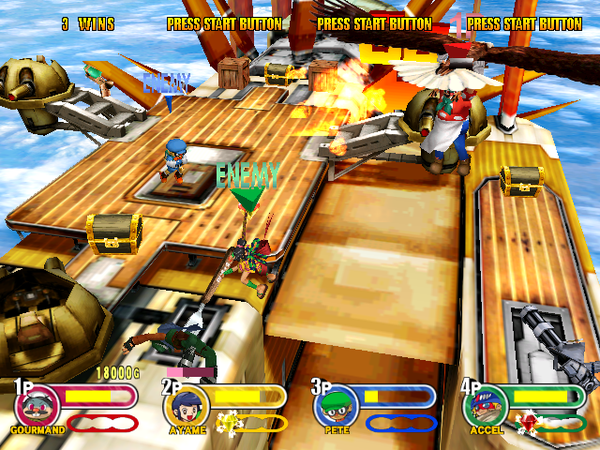 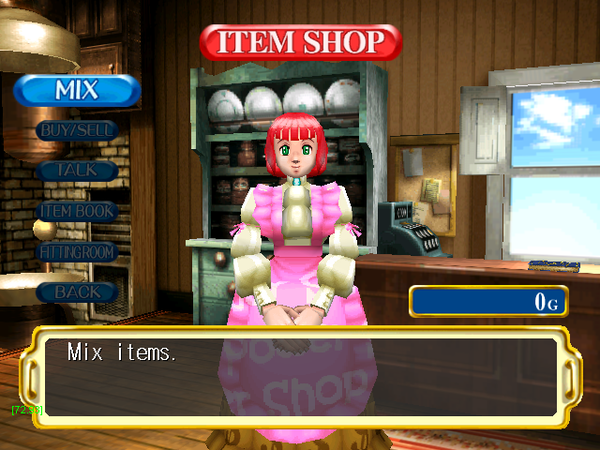 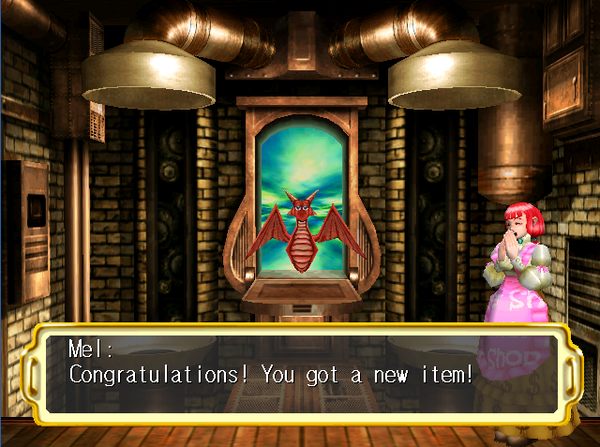 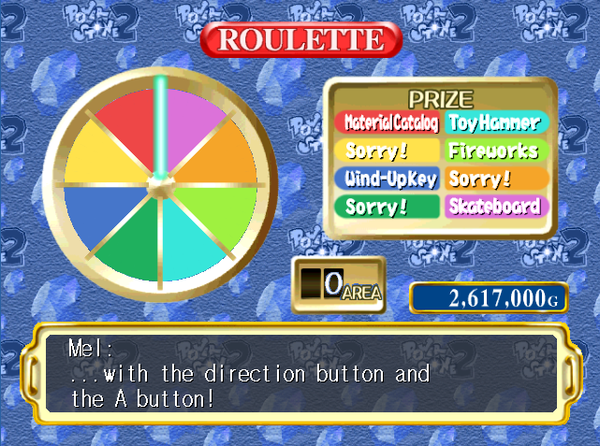 Additionally, a player may register up to five items in their inventory as "Handy Items". 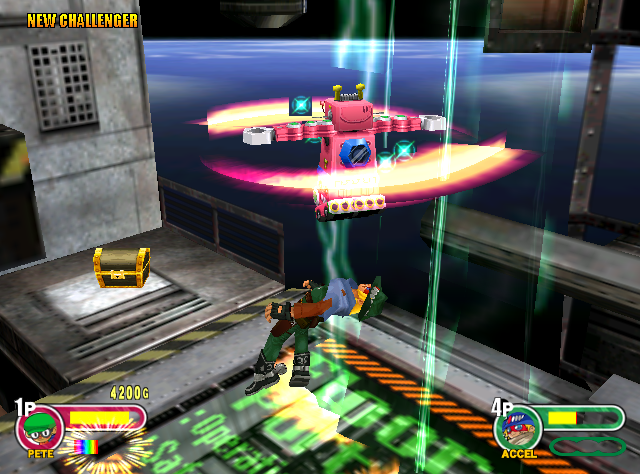 These may then appear to the player in Original mode, offering a tactical advantage. 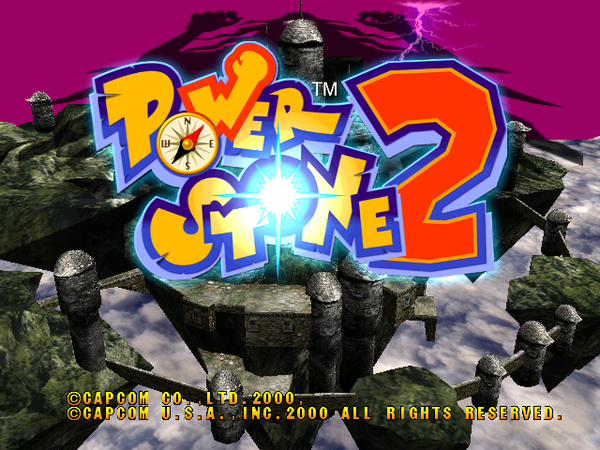 Final Words: Needless to say, if you enjoyed the first Power Stone, PS2 brings more of the mayhem that kept you playing the first time around. 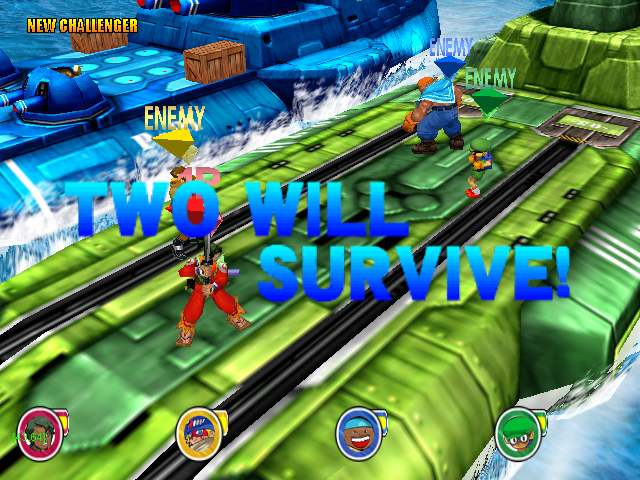 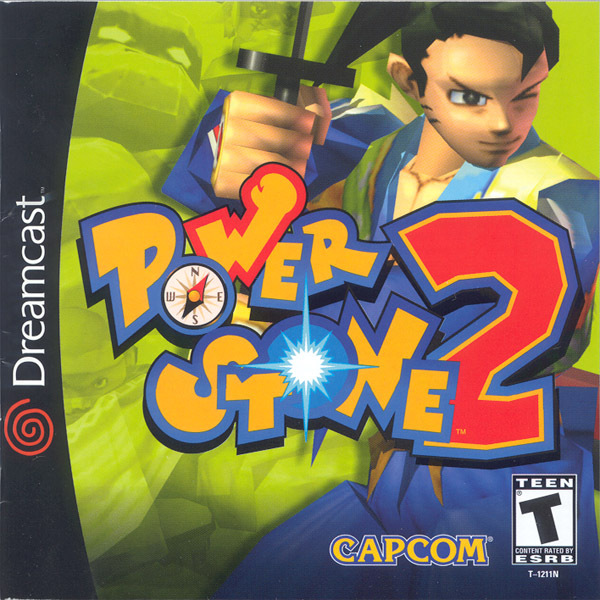 While Power Stone 2 was an improvement over the original and a noteworthy title on the Dreamcast, the "gimmick" seems slightly overdone this time. 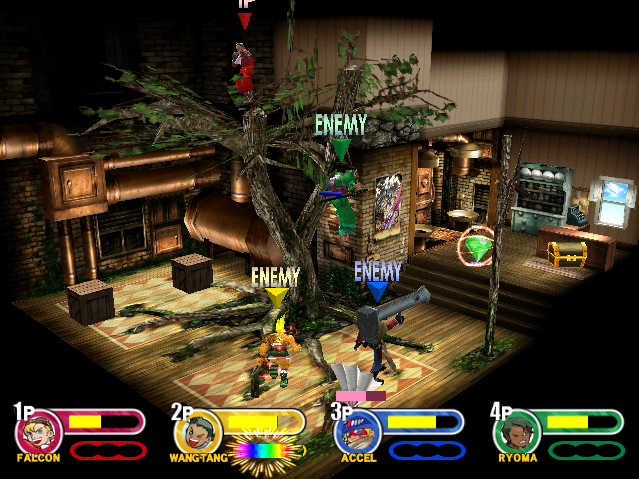 The evolving stages are innovative and cool, but do become redundant after a while.